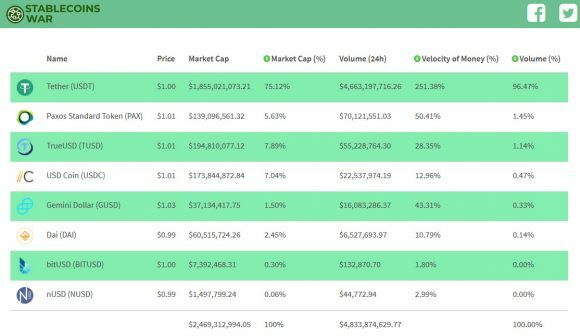 StableCoinsWar is an interesting new service that lists the most important data for a number of stablecoins such as their current price, market capitalization, market cap percentage, volume and velocity of money. A stablecoin is a cryptocurrency designed to minimize the price volatility, stablecoins are used as stores of value and are usually backed by fiat currency such as USD, EUR or other. You can get up to date and speed with a quick glance on the single page stats currently listing 8 of the most popular and used stablecoins with their top stats. Of course the top spot is held by Terher (USDT) as still the major stablecoin that is widely used, but it is slowly loosing positions to the number of newcomers. So if you use stable coins and want to be able to easily keep track on their performance, then do take a look at this useful service.